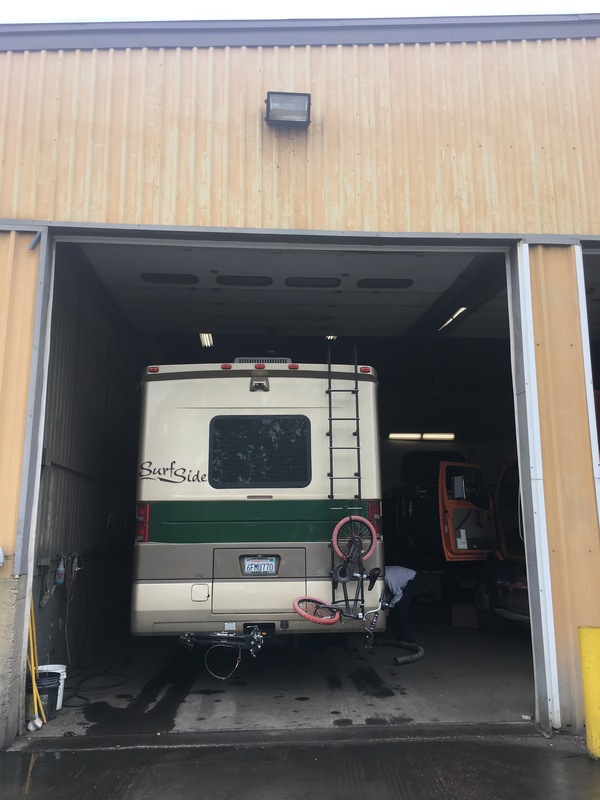 The Adirondacks, Lake Champlain, and Our First Breakdown – Neales…on wheels! After our stay in the 1000 Islands we headed east from Lake Ontario, towards the Adirondacks and Vermont. We found a campsite in Lyon Mountain, NY that happened to have a cell tower on the premises. High speed connection in a remote setting, a super nice owner, spacious site with panoramic views over rolling hills and lakes in the Adirondacks… what’s the catch? Bugs. Bugs were the catch. Specifically mosquitoes, swarms of gnats, and the most persistently annoying deer flies I’ve ever encountered. It was a really beautiful spot but we just couldn’t handle the bugs, especially when the mosquitoes found a way inside and our bedtime ritual included scanning the ceiling with a flashlight and killing half a dozen of them. Drive through upstate New York. After two nights we moved to Monty’s Bay Campsite on Lake Champlain. Cell service wasn’t great, but the bugs were much more bearable. The campground has been around since the early 1960’s and is still run by members of the founding family. The surroundings were beautiful and the place had a lot of character, which included narrow dirt roads with sharp turns. We had a spacious but oddly shaped corner spot that we really weren’t sure how we would get out of again, especially if it continued to rain. When the time came a neighbor offered to help Chris. The neighbor may have made the process more complicated than necessary, but it was a very nice gesture and he shared the interesting information that the campground was developed for the 1967 Montreal World Expo. Being so close the Canadian border, it was popular with the Quebecois and seemed to be a place that families returned to year after year. Rita and Charlie loved having so many kids to play with at the pool. Our campsite, and the Canadian flag hanging outside our neighbor’s site. Gorgeous view of Isle La Motte, VT on Lake Champlain. We enjoyed regional food specialties in the town of Plattsburg, including two versions of the Michigan – hot dogs with diced onions and a meat sauce, that were both delicious. We also discovered donut cones at The Happy Pike and can confirm that it is as good as it sounds. The donut cone was first created in Prague, where someone had the clever idea of taking a hollow pastry traditionally sold during the winter and putting ice cream inside to make it a year round treat. First stop for Michigans at Clare and Carl’s. The Japanese Bucket Mouth ice cream cone at The Happy Pike. And the donut cone, which was as good as it looks. There were a couple ferry options we could have taken to our next stop of Burlington, Vermont, but it wouldn’t have saved much time so we decided to drive around Lake Champlain. We passed through a couple charming towns before turning east at the Canadian border and traveling into Vermont instead. Unfortunately we missed the turn for scenic Route 2 down through Grand Isle in the middle of Lake Champlain, but we made up for it by getting the most out of our five nights at the wonderful North Beach Campground. We would have stayed longer if they weren’t completely sold out on the weekend. Reaching the border of New York, Vermont, and Canada. The campground was connected to the popular North Beach Park – which had a playground, picnic pavilions, and a snack bar – as well as the extensive Burlington Greenway bike path. Even when the weather was overcast and rainy, I still enjoyed being able to walk down to the beach with the dogs or the kids and take in the sublime view of forested shoreline and the rolling blue hills of the Adirondacks across Lake Champlain. Pedestrian tunnel from our campground to North Beach. The Adirondacks across Lake Champlain. We had a great family bike ride into Burlington, enjoying the changing scenery along the lake into town, and a delicious local treat, the maple creemee. I took Sky on a few solo rides; she loves to run alongside the bike. The kids and I went to a beautiful and lively library in town, and we all enjoyed burgers and fries at the local institution Al’s French Frys. We took a scenic drive and enjoyed a lakeside picnic lunch of lobster rolls, pastrami, and meatball subs from the incongruous Route 7 Liquor and Deli. But mostly we stayed around the campground, taking advantage of the easy proximity to the beach, playground, bike path, and gorgeous views. This picture perfect bridge was next to the park where we picnicked in Charlotte, VT.
Children’s Room at the Burlington Library. Our blissful Burlington days came to an abrupt end just a few miles outside the city when we stopped for gas on the way to Massachusetts. We weren’t hooked up yet so I was driving the Explorer. As Chris turned into the gas station, a wasp that made a sudden appearance inside the RV distracted him and the back driver’s side hit the high curb. The exhaust pipe was knocked down and then immediately flattened by the back left tires, and the generator exhaust pipe was also knocked off and trailing on the ground. Chris was able to pull to the side of the gas station without blocking the pumps or entrances. AAA roadside assistance was able to open up the exhaust pipe and secure it enough for us to drive to a garage a couple miles away that Chris had found. The 9-foot long generator exhaust pipe came inside the rig for the ride. In the meantime I called our next campground and a couple nearby hotels in case we needed to stay over night, but we were hopeful that wouldn’t be necessary. The garage had a bay available that we could simply park over while the mechanics worked below. It felt a bit odd to be sitting inside our home as usual, reading and playing on electronics, but there wasn’t too much else to do. Once it was determined that the engine exhaust pipe could be replaced and both reattached, we went out for lunch (leaving the dogs inside in their crate). Conveniently, we were near Al’s French Frys. When we returned the work was almost complete, and the bill was a lot less than we had braced ourselves for. Thanks for the great service, RSD National Leasing of Williston, VT! Not our most scenic camping spot. The delay cost us about four and a half hours. We made it to the Boston Minuteman Campground in Littleton, MA by 8:30pm, our latest arrival anywhere. The office was open and the staff really helpful, including the the host who led us to our site in his golf cart and guided Chris backing in to a narrow spot between trees – in the dark. Our campsite in the daytime. Considering that we’ve been on the road for a year and Chris has safely piloted our 34-foot motorhome – with a towed Explorer – for 12,000 miles on steep and windy mountain roads, freeways, narrow town streets, and through torrential rain storms, the fact that this was our first incident is a testament to his awesome driving skills. Next up: Experiencing East Coast history at Concord and Lexington, Massachusetts and Newport, Rhode Island; our first overnight in a house in months… and our first flat tire. Part of the wonderful Minute Man National Historical Park. So glad you were able to get repairs without delay! I need to go find a donut cone–that sounds amazing! Such wonderful memories you are making for your family. I hope you make a book for the kids to keep forever. Too bad you aren’t in the northeast a couple of months from now. The trees are so gorgeous. Reading all your stories sure makes me want to travel again. Thanks so much, Kathy! I am disappointed we won’t be in the NE for the fall, but hope to see some colors on our trip back West. Pingback: East Coast History, Humidity, Family, and a Flat Tire – Neales…on wheels!